Lynn Dorsett, from Barnham Broom in Norfolk, had always dreamed of working for herself. 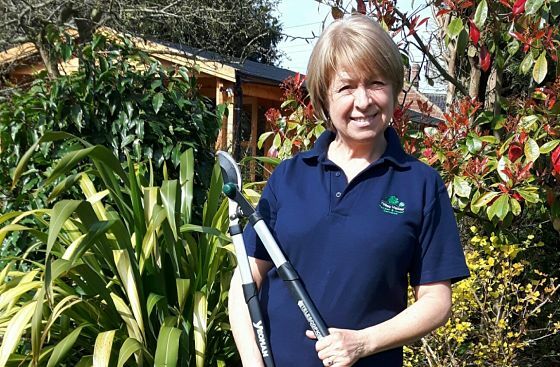 Having worked in a variety of public and private sector administration roles, when the opportunity arose to reduce her hours, it was her love of gardening and the outdoors which motivated her to explore the option of becoming self-employed. We spoke to Lynn about the Tiffey Valley Garden & Home Services and the happiness being self-employed has brought her. Tell us more about Tiffey Valley Garden & Home Services? Tiffey Valley Garden & Home Services was established in February 2017, and offers year-round garden maintenance and house care services in Wymondham, Diss and surrounding villages. My clients are people who enjoy spending time relaxing in their home and garden, but who don’t necessarily have the time or energy to maintain them. I offer a variety of home and garden services, including lawn mowing, weeding, pruning and border care, hedge trimming, planting shrubs, small trees and flowers, house de-cluttering, cleaning, and preparing homes and gardens for sale or let. My enthusiasm and passion for making a client’s environment the very best it can be, coupled with reliability and professionalism is what makes Tiffey Valley Garden & Home Services unique. I gained my first customer in March 2017 – it was a great feeling. All of my planning and hard work was beginning to come into fruition and I was very excited. I also felt relieved that the marketing of my business was working. What was the impact of support from Nwes? I was put in contact with Nwes Business Advisor, Victoria Williamson. Through the New Anglia Growth programme, I received over twelve hours of free 1-to-1 support and advice, which really helped to propel my business planning forward, and to maintain my focus. Nwes has been vital in helping to get Tiffey Valley Garden & Home Services started. Business Advisor, Victoria provided advice on all aspects of setting up a business, including tax, accounting, legal requirements, business profiles and marketing. The most important aspect of working with Victoria is that she has given me confidence with her positivity and encouragement. “I am thoroughly enjoying the new direction which becoming self-employed has taken me, and I am delighted that it has also given me the opportunity to work with local suppliers to support local people. Did you encounter any challenges on your start-up journey? It was a challenge writing a business plan. It really does make you question yourself…why do I think this idea will work, how will I make it happen? I managed to create what I think is a strong business plan by thinking about it in small sections, being realistic about what I could achieve, and plenty of re-writing! Some bouts of insomnia actually boosted my productivity during the planning stages. I wouldn’t recommend it, but the early hours of the morning were very productive for me. I researched the market, read business guides, created a website and produced business documentation all before 6.30am! Fulfilling my ambition and achieving what I set out to do. I am thoroughly enjoying the new direction which becoming self-employed has taken me, and I am delighted that it has also given me the opportunity to work with local suppliers to support local people. Over the coming months and years, I hope that Tiffey Valley Garden & Home Services will continue to bring enjoyment and happiness. I hope to have a group of regular clients who value my services highly, and to have a portfolio of interesting and varied jobs.